No longer alive and enclosed in a clear case, these insects and arachnids can be safely observed by all. 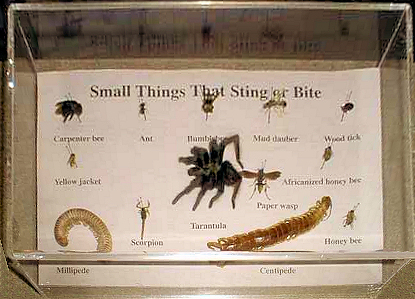 Although each of them is capable of causing varying degrees of pain in the wild with its sting or bite, not one is considered life-threatening. How do you know if it's a sting or a bite? Almost without exception, bites come from the mouth area and stings from the other end.